20 experts. will be speaking. Starts at 9:30 AM. The Scala LiftOff comes to Skills Matter! We are thrilled to partner with David Pollak @dpp, Kaliya Hamlin @identitywoman, Jennifer Holmes @dangerangel and the London Scala Community for a 2 DAY Scala LiftOff! This 2 day Scala Unconference will enable you to delve deep into Scala and Lift, as well as present projects in Speed Geeking sessions. 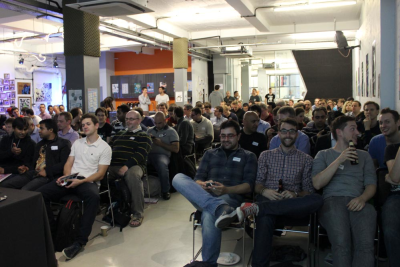 Stay tuned for information, on this page, or follow updates on twitter @skillsmatter #scalalol. I have used Scala, Lift (and Akka) on and off for 18 months. I'd like to share with you my experiences and learn what projects are in production and what challenges others have faced. When is an Object too Big & Complex to be Immutable? In this talk, we discuss when is an object too big and complex to be immutable. Kaliya Hamlin, aka Identity Woman, gives a recap of the Day 1 activities. Mads Hartmann Jensen talks about Lifty. In this talk, Mathias Doenitz discusses parsing in Scala: combinators and parboiled. In this lightning talk, Marthias Doenitz presents Parboiled - Scala Parsing DSL. In this talk, Kevin Wright presents MineSweeper for Scala and Lift. In this lightning talk, Jeppe Nejsum Madsen gives his take on why Scala and Lift. Jeppe Nejsum Madsen is the CTO of FleetZone, a company that provids a SaaS based fleet management platform written in Scala & Lift. He's a committer at the Lift project and an enterprise consultant and architect. In this talk, Arthur Embleton talks about Scala on the Play! In this talk, Pawel Krupinski discusses the issues of Scala Testing. Ivan Porto Carrero discusses MongoDB and Scala.